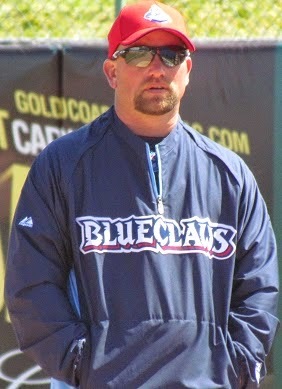 Former big leaguer Aaron Fultz is in his fourth season coaching in the Phillies' developmental ranks. In his career, the lefty Fultz tallied a 25-15 record with a 4.26 ERA and three saves over eight major league seasons. Now, the 41-year-old is leading the Class A Lakewood BlueClaws' pitching staff toward their dream of reach the top level of the sport. Recently, I chatted with Fultz about various topics related to his young prospects. Read ahead for those interview excerpts. -What are you impressions of your pitching staff in the early going this year? So far, I've been really pleased with the amount of strikes that we've thrown. We haven't walked many guys. There's still some mistakes here and there, but overall very pleased with the way we're going about the game. -Matt Hockenberry's got a true closer mentality and persona, as he mans the late innings for the BlueClaws. He's a Temple guy with local ties. What are your thoughts on Matt and what his ceiling could be? You know what, he had a rough year here last year and he came to me in Williamsport and for me, he was outstanding. I loved just- he's very confident and some would say a very arrogant guy. But, I love his demeanor on the mound. He's very confident. He's goes out there and used all his pitches. I mean, so far, from last year and this year, I love what I see. And he's got the ability to be able to repeat it and do it every day. -Out of spring and in the early portion of the season here, is there anyone on your staff that strikes you as performing at a higher level that you anticipated? I had definitely high expectations of Ricardo Pinto. I had him last year. I picked him to be the opening day guy. A lot of the guys had good spring trainings. Alexis Rivero was a guy that made this team- he had a great spring. A lot of the guys, are doing really well. It's hard to say they're exceeding expectations, but we're off to a good start. -Any thoughts you can share on the guys in your starting rotation? Just going through the rotation- Josh Taylor, we got him as an undrafted free agent last year. I saw him in instructs last year and I loved his arm. He's going to be a really good one. I don't know how he slipped through, but he did. We got a good find there. (Tyler) Viza impressed me in spring training. I hadn't seen him throw a lot before this year and he's a guy that's going to go after them and throw strikes, maybe too many strikes at times, but he's definitely learning and getting better. Ranfi (Casimiro) had a rough (first start), but when he clicks, he's as good as anybody I've seen. We just gotta do that more often. He'll throw two out of 10 maybe that are really unbelievable. But, we just got to get him more consistent with that. -In recent seasons we've seen Yoel Mecias in Lakewood and his change up was always raved about as big league ready. Is there anyone on your current staff that really has that standout pitch? Pinto's got a change up that's as good as Mecias's or better. Chris Oliver throws some good change ups. Josh Taylor's got a good slider. You know, several guys with plus pitches. Again, it's still early, but Ricardo, his change up's as good as I've seen in a long time.